Okay, so technically they aren’t being ‘given’ away…work with me here. So many festive words and phrases for your December Daily or Project Life. 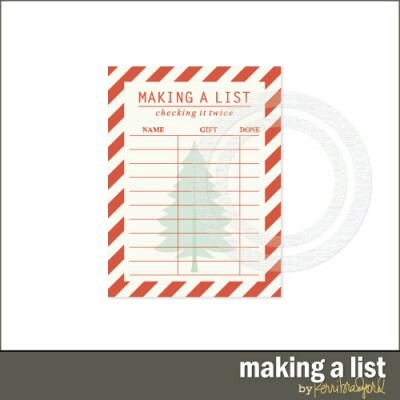 It even includes a little 3×4 Fa La La card, because–gosh darn it–I couldn’t help myself! And what be the one-day-only freebie, you say? Well that would be this fun card. Use big or small. It’ll be darling either way. I just have to add one little note here. My mom passed away a little over ten years ago. And when we were going through her many boxes of ‘life bits’ that she kept over the years, we came across a Christmas list or two that she’d written. It was golden. I thought it was the coolest thing. I think I’ve kept most of my lists that I’ve made for my family over the years. I hope they will treasure the sentiment as much as I treasured my mother’s hand-written notes for our gifts. Don’t forget to enter the giveaway in yesterday’s post! Thank you Kerri! 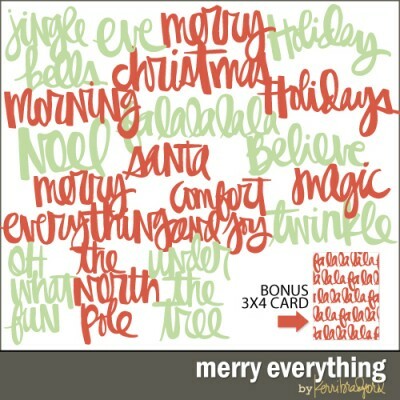 Merry Everything is just what I need to complete my Christmas cards! Thanks, too, for all the fabulous freebies! Adorable, thank you!! Merry Christmas! So many lovely Christmas products to choose from. Thank you! I’m so glad you have your Mum’s notes to cherish. Hope you enjoy a safe and lovely Christmas.